The Make Your Move campaign has now ended and this page will no longer be updated. What is Make Your Move? This challenge will not only improve your balance but you’ll learn a fun party trick at the same time. Not touched a Hula Hoop in years? Channel your inner child with this quick and effective workout which will work your waist and keep you stable on your feet. This challenge not only helps tone your core muscles, but also improves your joint flexibility and, of course, your balance. Practising a little each day means you’ll constantly be impressed with how long you can Hula each time. Aim To improve balance and core muscle strength while having a hula hooping good time. Benefits Hula Hooping improves your spine’s flexibility, posture and balance as well as providing a complete core workout. This low impact, high energy exercise will burn calories and increase hand-eye coordination skills. Goal To get the full benefits to your balance and health, and to really notice a change in your ability you will need to commit to at least 15 minutes a day for about a month. Practice makes perfect so you will see results sooner if you put in the time, but go at your pace. This isn’t a competition with you or with anyone else. Next steps Once you have mastered the technique the key is to improve your speed and hula for longer. If you want to get social, there are hula-based fitness classes all over the country. Standing with your feet apart, place hoop above lower back ensuring it’s touching your body. Leaning to one side and holding the hoop at belly level, push either your right or left hand across your stomach (depending on which way you want to spin). Standing still - allow the hoop to slowly spin around your body, falling to the floor. Do these 5 times to start with and then every day in your first week to get familiar with the feeling of the hoop on your body and dropping to the ground. Now you should be used to the speed and rhythm of the hoop, it’s time to push it. Stand with your feet at shoulder width apart and move from side to side as the hoop moves around your body. When you feel the hoop hit the front side of your stomach, push against it. Continue this movement side to side for as long as possible and keep your arms out to the side to help you balance. Practise this for at least 10 minutes a day until you are starting to see some progress and can hoop continuously for around 5 minutes. Now that you are hula hooping, slowly bring your feet together and raise your arms above your head keeping your core tight to give the core muscles a good workout. Keep a count of how many rotations you are able to do, anything up to 1 minute is brilliant. Put on some music and aim to hula for 10 minutes a day, build up time and speed as you get better. For a full workout, our Hula expert tells us to aim for 20 minutes of hula action. Track your results - motivation looks different for everyone, but nothing helps you to see progress like looking back at how much you have achieved. If you would like to keep a manual diary, print this Hula Hoop tracking sheet and keep notes. Show us how you are getting on. Use #MakeYourMove on Twitter, Instagram or Facebook to join the conversation on Twitter, Instagram and Facebook and see who else is hula hooping their way to better balance. What type of hoop do I need? 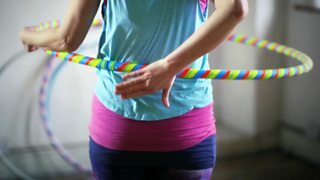 To get the full benefit of this challenge, our expert advises participants to use an adult hula hoop These hoops are much bigger and heavier which take longer to move around the body, allowing more time to perfect the moves. You can find adult hoops in high street shops or online. Alternatively hoops can be made out of plastic water pipe if you fancy having creating your own. Worrying what other people might think often stands in our way when we are thinking about exercise. If you are worried about looking silly, it sometimes helps to know that you won’t be the only one hula hooping in the hope that one day you might be fitter.